Let’s take a quick look at three MSR projects being presented at the conference. One of the Best Paper awards went to the “Skinput” project, one of the most popular demonstrations at last month’s MSR TechFest in Redmond (see the WIRED coverage of that, Skinput Turns Your Arm into a Touch-Screen). Skinput, an example of a Human-Body User Interface, is described in the paper Skinput: Appropriating the Body as an Input Surface by Chris Harrison of Carnegie Mellon University and Desney Tan and Dan Morris of Microsoft Research Redmond. In the photo at right, a sensing armband and a pico projector enable interactive elements to be rendered onto a person’s skin. Here’s a link to the paper and project background, and you can also watch a video clip of Skinput in action with some technical background on the sensing devices and evaluation tests. We explore a division of labor between pen and touch that flows from natural human skill and differentiation of roles of the hands. We also explore the simultaneous use of pen and touch to support novel compound gestures. We advocate a division of labor between pen and touch: the pen writes, touch manipulates, and the combination of pen+touch yields new tools. This articulates how our system interprets unimodal pen, unimodal touch, and multimodal pen + touch inputs, respectively. We contribute novel pen + touch gestures that leverage the strengths of both pen and touch; utilizing both modalities to complement one another also enables us to largely sidestep the weaknesses inherent in each modality as well. Click the video above to see Manual Dexterity in action, and then watch this year as new Tablet PCs and hybrid devices are rolled out to compete with the iPad, running Windows 7 enabling multitouch gestures and pen input. Finally, there’s a CHI paper about MSR’s Embodied Social Proxy (ESP) telepresence project, which I described in an earlier post. I mention it because the ESP project came up in conversation last week with a Microsoft colleague whom I encounter practically daily, but almost exclusively virtually – even though we work in the same city. A little back-story: In June 2008, I met a smart young guy named Mark Drapeau when he was at the National Defense University, on a AAAS post-doctoral research fellowship. We were participating in a Strategic Communications Exercise at NDU’s Center for Technology and National Security Policy. Dr. Drapeau was hired in 2009 by Microsoft, as Director of Innovative Social Engagement in our U.S. Public Sector outfit. We’re both based in Washington DC, although my actual office is in a Microsoft building in Reston, Virginia, while he’s in a different Microsoft building in Chevy Chase, Maryland. As colleagues, we’ve worked on several little projects together – but we rarely see each other in person. Although I first knew him in person, I now see far more of the virtual Mark, through his widely-followed persona on Twitter (@cheeky_geeky and also @Microsoft_Mark) or his blog. Friday we both turned up at the same event: the kickoff of DC Codeathon for Citability, a neat project I blogged about last week. We chatted about the fact that we rarely see each other face-to-face but tend to collaborate on projects in a virtual-teaming way, though mostly by happenstance. I mentioned to him the MSR ESP project, and he was fascinated by the possibilities, with some new ideas for its use within a large distributed enterprise like Microsoft. 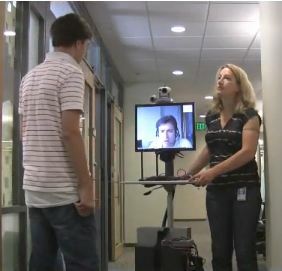 Watch this video of ESP – the action begins around the 3-minute mark, and I think you’ll see the potential in these new means of virtual collaboration through telepresence. In essence, I could deploy an ESP rig, preferably on a pair of robotic wheeled tracks, in our offices to enable just about any Microsoft researcher from around the globe to participate as a virtual embed in Microsoft Institute meetings and projects. Neat idea. For more on CHI 2010 see the conference website here, or follow the hashtag #chi2010 on Twitter for real-time reporting by attendees. This surely settles the future 666 mikrochip of the book of Revelation/Apokalupsis.The Unveiling Of Jesus Christ. I assume you’re referring to the projection of the number-pad on the hand 🙂 Don’t worry, it’s not permanent. I really like the Skinput idea, will you be building that into gaming platforms like Xbox? Very cool video. watch for Project Natal news this fall, we’re definitely going to have some interesting NUI scenarios using that platform for gaming. thanks for the question. you guys should be putting out the Courier tablet right away, with the pen+touch capability, blow the iPad away!! !